When homeowners in your area are asking themselves that all-important question – “who ya gonna call?” – make sure they know how to find you (and not the Ghostbusters) by showing off your handyman skills on a custom-designed flyer. 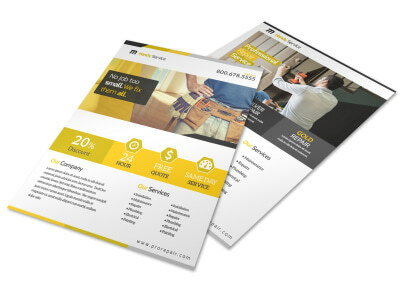 Our design team knows how valuable your time is, so they’ve put together a variety of professionally-crafted handyman flyer templates to get you started. Take advantage of the tools in our online editor to add your own content and make any design changes, then share or print absolutely anywhere! 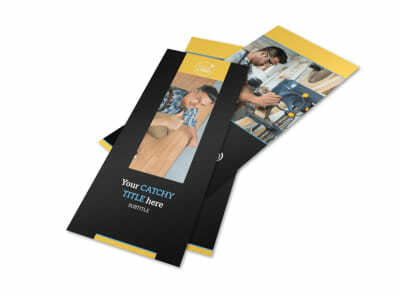 Become the most sought-after home remodeling handyman in Lake Wobegon (Yes, that's the fictional town created by Author Garrison Keillor) – design a home improvement flyer that gives potential clients the utmost confidence in your skills. Hang your flyer down the street at Bigger Hammer Hardware, Ralph’s Pretty Good Grocery, and the Chatterbox Café. List your credentials and specialties, and put together a brief description of why you do what you do. Curate client testimonials to encourage prospective customers with the satisfied words of their neighbors. A headshot adds credibility to your business and helps people put a familiar face to the name on the flyer. Add your contact info and you’ll be all set – design and print with our online editor today so that you can start swinging your hammer tomorrow! Whether your trade heroes are Bob Vila and Norm Abram of This Old House fame or Tim “the Toolman” Taylor and Al Borland of Tool Time, letting your potential clients know what you have to offer is critical to building and maintaining your handyman business. Design a refrigerator-worthy flyer that ensures you will be their very first call when they hear a creaky floorboard or banging pipe. Include your logo, contact details, hourly rate, services offered and seasonal package deals (fall gutter clean-out, winter snowblower prep). 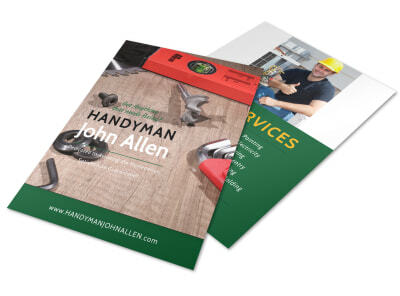 Utilize our design tool to produce and print a fabulous flyer in no time at all – just don’t try to add more power (it never ended well for Tim)! Are you the neighborhood Mr. (or Ms.) Fix-It? The first call at the sound of a leaky faucet or creaky step? 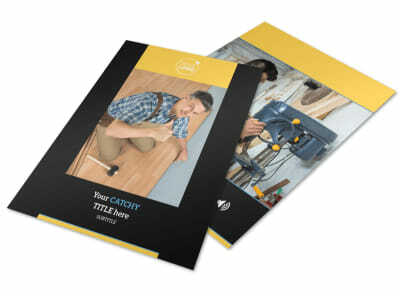 Turn your obvious skills and existing client base into a profitable handyman (or woman!) 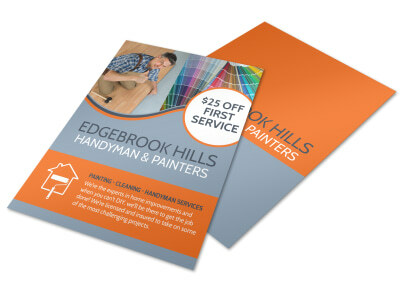 business by advertising your paid services with a custom-designed flyer that inspires homeowners near and far to enlist your help in times of un-handy trouble (or even just to complete a never-ending “Honey-do” list). Include your areas of expertise, hours of availability, and the best number to contact you. Throw in a great testimonial and a note that references are available upon request. 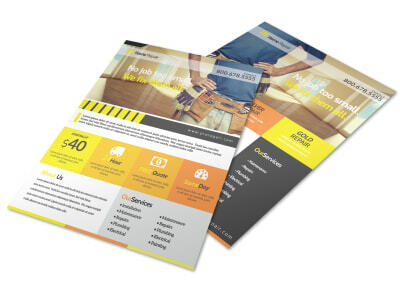 Get to work fixing up your flyer with our online design tools today! Give your prospective home repair or improvement clients confidence in your integrity and your commitment to quality by providing them with a free estimate and scope of work. 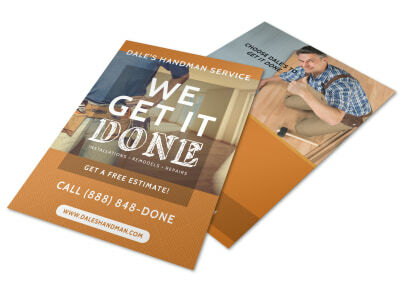 Design and personalize your own free estimate flyer and distribute them throughout your community – who says a handyman can only swing a hammer? Include the number of days for which your estimate will be honored and highlight your contact information so that they don’t have to search for it with a magnifying glass. Employ the tools offered in our online editor to construct the ideal flyer – you’ll be walking the neighborhood with your clipboard and carpenter’s pencil faster than Tim Taylor can drive a souped-up lawnmower!